Provincial governments in Canada are commonly referred to as a “level of government.” What exactly does this term mean? It is useful here to think of Canada as being governed by different layers of government simultaneously, which are defined by their geographical boundaries, constitutional status, and particular powers and jurisdictions. These include the national level of government (referred to as the “federal government”), the regional level (which includes provinces and territories), and local level (which includes such things as municipalities and local boards and agencies). The provinces, as a regional level of government, have their own specific powers and jurisdictions, and are authorized to pass legislation within their particular regional boundaries. (In contrast, the federal government may pass laws applicable to the whole country). Canada has 10 provincial governments: British Columbia, Alberta, Saskatchewan, Manitoba, Ontario, Quebec, Newfoundland and Labrador, Nova Scotia, New Brunswick and Prince Edward Island. Moreover, like the federal government, the provinces are recognized under the Canadian Constitution (and its principle of federalism) as being constitutionally autonomous. In other words, they are granted constitutional powers that cannot be altered unilaterally by other levels of government, such as the federal government. With this in mind, the provinces are quite different from territories, the other type of regional governments in Canada. Canada has three territories: the Northwest Territories, the Yukon, and Nunavut. Whereas the provinces are constitutionally autonomous, the territories are constitutionally subordinate to the federal government. This means that the federal government has the power to create territories, as well as to decide what powers and jurisdictions they will enjoy. Exclusive provincial jurisdiction refers to areas in which only the provinces are allowed to pass laws, while the federal government cannot enacting legislation in these areas. Exclusive federal jurisdiction includes areas in which only the federal government may pass laws, thereby prohibiting the provinces from enacting legislation in these areas. Joint powers/jurisdictions refer to areas in which both the provinces and the federal government may pass laws. Overall, political scientists commonly characterize Canada as being significantly decentralized in its division of powers. This is due to the fact that the provinces control several critical areas of public policy, as well as having access to important sources of government revenue. First, the provinces have exclusive jurisdiction over key areas of social services, such as health care, education and welfare. Today, these areas form the core of Canada’s modern welfare state and are considered to be central public interests. Second, the provinces have exclusive jurisdiction over property and civil rights. The former has been interpreted under the Constitution to include anything subject to ownership, such as real estate, animals, liquor, vehicles, merchandise, stocks, bonds, etc. Civil rights include such things as contracts, labour-management disputes, marketing, credit, adoption and child welfare. The breadth of property and civil rights further raises the profile of the provinces as an important level of government in Canada. Third, the provinces have exclusive control over local government. With this jurisdiction — in conjunction with others, such as intra-provincial transportation and property rights — the provinces dominate a broad range of important local issues, including urban and rural development, property taxation and local infrastructure (for example, roads, sewers, garbage collection, etc.). Even though many are administered by local governments, the provinces often play a central role in setting local government budgets, priorities and powers to deal with these issues. While the provinces are an important level of government in Canada, there are limits on their powers and jurisdictions. To begin, the Constitution grants the federal government exclusive jurisdiction in several areas of public policy, such as foreign affairs, national defence, First Nations, criminal law, interprovincial/international transportation, trade and communication, to name a few. The provinces are constitutionally precluded from passing legislation in these critical areas of public policy. The Constitution further provides for several federal controls over the provinces: the declaratory power and the powers of disallowance and reservation. The first of these allowed the federal government to assume control over local works that were deemed to be in the national interest or in the interest of two or more provinces, regardless of whether it fell within exclusive provincial jurisdiction. The powers of disallowance and reservation allowed the federal government to review and reject legislation passed by provincial legislatures. For the first 30 years after Confederation, all three powers were actively used. Over time, however, their use has gradually declined, ceasing completely in the mid-1900s (reservation and declaratory powers were last used in 1961, while the power of disallowance was last exercised in 1943). A third limit on the provinces is the federal government’s spending power While the Constitution forbids federal and provincial governments from passing laws in areas that are under the other’s exclusive jurisdiction, it does not prohibit them from spending money in those areas. The federal government has actively used its spending power to influence provincial policies and programs, particularly in the areas of health care and social services. In the case of health care, for example, the federal government transfers billions of dollars annually to the provinces to support their public health systems. Moreover, the federal government places important conditions on the provinces in order to receive this money, which are stipulated in the Canada Health Act. If a province fails to meet these conditions, then the federal government withholds portions of its federal transfers. In this way, the federal government can indirectly influence provincial policies in areas that fall outside federal jurisdiction. See the Issues in Canadian Provincial Government section of this article for more information on debate surrounding federal spending power. Another key limit on provincial power is the Canadian court system, particularly in the context of Canadian federalism and the Canadian Charter of Rights and Freedoms. In Canada’s system of federalism, the courts are responsible for interpreting the basic powers and jurisdictions of the different levels of government. Moreover, in regard to the Charter, the courts interpret citizens’ rights vis-à-vis their governments, including the provincial level. Since the enactment of the Charter in 1982, there have been hundreds of cases in which the courts have rejected provincial laws and programs on the grounds they failed to properly respect citizens’ constitutional rights. The executive branch refers to the part of government responsible for directing government and implementing policy and legislation. This is in contrast to the legislative branch of government, which is responsible for debating and passing legislation and, in Canada, holding the executive accountable. In Canada, the executive branch is constituted by two key elements: the monarchy, and the premier and cabinet. Like the federal government, the provinces operate under a constitutional monarchy, in which the Canadian Monarch plays a central role in the operation of provincial government. The Monarch must grant Royal Assent to all provincial legislation before it becomes law. Moreover, the Monarch has the power to appoint key legislative and government officials, as well as to open and close legislative sessions, and to dissolve legislatures. At the federal level, the Monarch’s day-to-day duties are performed by his/her Canadian representative, the Governor General of Canada. The Monarch also has representatives at the provincial level, called lieutenant governors, which perform his/her activities in provincial legislatures. Lieutenant governors are formally appointed by the federal Governor General on the advice of the provincial premier and cabinet. As is the case at the federal level, the Monarch’s powers are mainly ceremonial, and are exercised, in practice, by the premier and cabinet (also commonly referred to as the executive council). Provincial cabinets comprise office holders called ministers who are responsible for particular areas of public policy, and oversee large government departments (for example, the minister of health heads the ministry/department of health and provincial health policy and programs). The provincial cabinet represents the centre of executive political power. In addition to exercising many of the powers of the Monarch, the cabinet typically determines government priorities, sets the levels of taxation and spending, makes key appointments and oversees the administration of government departments. The size of a provincial cabinet varies in proportion to the size of the particular province. Prince Edward Island, for example, tends to have around 10-15 cabinet ministers, while Ontario’s cabinet averages around 25-30 ministers. In theory, cabinet ministers are individually responsible for their departments and collectively responsible for government policies. In practice, however, provincial premiers tend to dominate provincial cabinets. The premier is the effective head of the provincial government, and is equivalent to the federal prime minister. Like their federal counterpart, provincial premiers have the power to appoint and dismiss cabinet ministers. This, in turn, provides them with considerable power to direct cabinet priorities and policies, as well as the general operation of government. A premier may choose cabinet ministers that demonstrate loyalty and/or reflect his/her own political point of view, and may dismiss ministers that fail to tow the premier’s line. Modern provincial cabinets operate with formal procedures and under a cabinet committee system. Under this system, ministers are assigned to committees that oversee broad areas of public policy. Key committees tend to be those concerned with social and economic development, such as government finances, health care and the economy, and are usually staffed by senior cabinet ministers. Also like their federal counterpart, the provinces are structured according to a parliamentary system of government. Under this system, the elected executive branch of government is fused with the legislative branch in two important ways. First, the premier and cabinet ministers are elected members of the provincial legislature. Second, the premier and cabinet must maintain majority support in the legislature (this is referred to as maintaining the “confidence” of the legislature). If the premier and cabinet lose the support of the legislature, then their government will fall, usually leading to a general election. This “fused” system differs from other types of government, such as the presidential and governor systems in the United States, where the executive is elected separately and serves for a set term, regardless of whether they maintain majority support in the legislature. There is, however, one key difference between the federal and provincial parliamentary system. The federal Parliament is a bicameral legislature, meaning there are two legislative bodies: the House of Commons and the Senate. In order for federal legislation to be enacted, it must be passed by a majority in each body. Provincial legislative branches, by contrast, are unicameral as there is only one legislative body (referred to as the legislative assembly, national assembly, or house of assembly). These provincial legislatures operate much in the same way as the federal House of Commons. Members are elected at the local constituency level and are responsible for passing all legislation under their respective jurisdictions. With few exceptions, provincial electoral systems are similar to their federal counterpart. A province is divided into geographically based electoral districts, each with their own elected representative. In most provinces these representatives are called Members of the Legislative Assembly (MLAs), while in Ontario they are termed Members of the Provincial Parliament (MPPs), in Newfoundland, Members of the House of Assembly (MHAs), and in Quebec, Members of the National Assembly (MNAs). Provincial electoral systems operate under two principles: 1) single-member constituencies and 2) first-past-the-post elections. Single-member constituencies simply mean that there is only one MLA per electoral district. First-past-the-post refers the rules by which that single member is elected. During an election, the candidate in an electoral district which receives the most votes wins, regardless of whether s/he won a majority of the votes. In provincial legislatures, the forming of a government is dictated by the political party system. In most cases, the leader of the political party with the most elected MLAs becomes premier. The premier, in turn, selects other MLAs from his/her political party to join the cabinet. Just as with the federal system, this may result in majority governments, minority governments, or even coalition governments, depending on whether the largest political party wins a majority of the seats in the provincial legislature. Provincial political parties often mirror those found at the federal level. 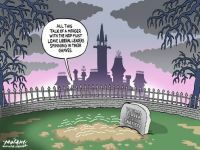 Most provinces have a provincial Liberal Party, Progressive Conservative Party, New Democratic Party and Green Party. In some cases, strong links exist between the federal and provincial elements of the party; this is particularly true for the New Democratic Party. In other instances, the parties are completely independent of one another. This is often the case between federal and provincial conservative parties. Many provinces, moreover, have unique political parties that do not exist at the federal level. Examples include the Saskatchewan Party in Saskatchewan, and the Parti Québécois and the Action démocratique du Québec parties in Quebec. One significant difference between federal and provincial electoral systems is the existence of recalls. A recall is a process by which residents of an electoral district may remove their elected representative between general elections, and is typically done through a petition process. As of November 2008, British Columbia was the only jurisdiction, federally or provincially/territorially, to have implemented a recall process. Provincial governments, as a whole, are responsible for hundreds of billions of dollars annually. In 2007, revenue for all provincial and territorial governments totaled more than $320 billion (Statistics Canada, June 2008). Of that total, approximately 83 percent resulted from provincial/territorial governments’ own sources of revenue, while 17 percent was in the form of transfers from other government subsectors; namely, the federal government. Key federal transfers to the provinces included the Canada Social Transfer, the Canada Health Transfer and payments under the Equalization Program. Outside of federal transfers, income and consumption taxes formed the largest portion of provincial/territorial revenue in 2007 (this includes taxes on the harvesting of natural resources). Other key sources of revenue include contributions to social security plans, the sale of goods and services and provincial/territorial investment income. *Other Own Source Revenue includes health and drug premiums, contributions to social security plans, sale of goods and services and investment income. In regard to expenditures, provincial/territorial governments spent approximately $310 billion in 2007. By far, health, education and other social services represented the largest portion of spending. In 2007, the provinces and territories spent approximately $230 billion in these areas, representing 74 percent of total expenditures (Statistics Canada, June 2008). Another key expense for the provinces and territories was debt maintenance, which accounted for $24 billion in 2007, or 8 percent of total expenditures Statistics Canada, June 2008). In managing these large sums of public monies, each province has developed its own particular financial system. Nevertheless, there are many commonalities. All provincial governments are required to summarize their financial activities in an annual budget. This document provides an overview of all government revenue and expenditures for a given fiscal year, and is presented to the provincial legislature for examination and approval. Furthermore, all provincial governments have a ministry of finance helmed by the minister of finance. This government department is responsible for recommending taxation, fiscal and economic policies to respective premiers and cabinets; managing provincial finances; and developing and allocating provincial budgets. Ministries of finance are guided and supported by provincial treasury boards, which are cabinet committees, comprising the premier and senior cabinet ministers (including the minister of finance). While the precise mandate of the treasury board can differ from province to province, its basic role is to set out key financial and economic policies for the province, and to oversee government departments to ensure these priorities are properly implemented. Another common feature of provincial finances is an independent auditing office, commonly referred to as an auditor general or comptroller general. The purpose of this office is to hold the government accountable for its administration of public funds. In doing so, the office will regularly review the finances of government departments and agencies to ensure they are engaged in proper accounting practices and are providing provincial residents with value for their money. Provincial auditing offices report to their respective provincial legislatures, and enjoy a significant level of independence from the government itself, so as to ensure impartiality in its auditing. Another key element of provincial governments is their public services or bureaucracies. Considering the wide range of provincial powers and jurisdictions, and the hundreds of billions of dollars provinces collect and spend annually, these public services are critical to the operation of provincial governments. This includes the general government departments and agencies; health, education and social services; and government enterprises, such as Crown corporations. The size and breadth of a province’s public service depend on a number of factors. Provinces with higher populations tend to have larger public services, due to the greater number of clients needing government services. Financial capacity is another important factor, as wealthier provinces are able to maintain a larger public sector than less wealthy ones. Government ideology can also influence a province’s public sector; governments that prefer a limited role for the state in society tend to have proportionately smaller public services than governments favouring greater state intervention. In terms of employment, the provincial public sector dwarfs that of the federal government. Moreover, some provinces alone have larger public services than the federal government. Ontario and Quebec, for example, employed 752,579 and 593,500, respectively, in their public sectors in 2007 (see below). * Federal employment in the military, health, education and social services is included in General Government figures. **Provincial figures do not include local government employment. ***New Brunswick primary education employment is included in General Government figures. Political control of provincial public services operates much in the same manner as at the federal level. Cabinet ministers are responsible for particular government departments and ministries, and are supported in this capacity by senior bureaucrats, such as a deputy minister. These departments and ministries are, in turn, responsible for overseeing the administration of key areas of public policy, as well as government agencies, Crown corporations and other business enterprises. Provincial public services are highly professionalized, with education standards and codes of conduct. In the context of general government departments and agencies, hiring, training and disciplinary action is often overseen by a dedicated and independent government agency, such as a public service commission or board. Each Canadian province has its own set of political, economic and social interests and challenges. Nevertheless, there are several basic issues that are common to all provinces. Three prominent issues in Canadian provincial government are discussed here. One of the key social factors in Canadian politics, both at the provincial and national level, is the place of Quebec in Canada. In 1980 and 1995, the Government of Quebec held provincial referendums on whether to pursue some form of independence from Canada. In both cases, Quebecers rejected the notion. Moreover, in the 1990s, the provinces twice entered into negotiations with the federal government in an attempt to gain Quebec’s consent to the country’s modern constitutional framework (when the new constitution was introduced in 1982, Quebec’s premier René Lévesque refused to sign the document). The threat of Quebec separatism has many potential and real consequences for the other Canadian provinces. If Quebec were to separate, then the country would be physically divided into two parts, with Ontario and the Western provinces on one side, and the Atlantic provinces on the other. This could, in turn, have important implications for interprovincial transportation, communication, trade and commerce. Additionally, federal attempts to accommodate Quebec within Canada have had significant implications for the provinces. During the 1970s and 80s, for example, the federal government pursued a policy of pan-Canadian bilingualism and biculturalism. Central to this policy was a rejection of the “Quebec as a distinct society” model, in which Quebec is recognized as the homeland of French Canadians and, as such, is deserving of special status and rights within Canadian federalism. Instead, the federal government’s pan-Canadian model worked towards creating a single Canadian culture, which was both English and French in nature. This resulted in several initiatives that impacted provincial governments, such as the teaching of French in provincial schools. Subsequent federal governments have moved towards the “Quebec as a distinct society” model. The clearest examples of this were the failed Meech Lake and Charlottetown accords of the early 1990s, in which the federal government attempted to meet specific demands by Quebec for more powers. While these constitutional reforms did not pass, they do highlight a general federal strategy towards granting Quebec more provincial powers and jurisdictions. These powers, moreover, are often extended to all provinces in turn, thus contributing towards a decentralized federal system. Following the second Quebec referendum in 1995, the federal government promised not to change the Constitution without first gaining the approval of all regions. It also transferred jurisdiction over labour-market training to all of the provinces. Another central issue is federal-provincial conflicts over fiscal federalism; that is, the complex financial relationship between the two levels of government. Two elements are critical to this issue: 1) reductions in federal transfers in support of key provincial social programs, such as health care; and 2) allegations of a fiscal imbalance. As discussed above, the provinces hold exclusive jurisdiction over areas of social policy, such as education, health care and other social assistance. Nevertheless, in the mid-1900s, the federal government attempted to develop a national welfare state by encouraging individual provinces to adopt uniform public health care, education and welfare programs. In doing so, the federal government promised to support significant portions of these programs’ costs; in regard to health care, for example, the federal government initially promised to pay for half of provincial health care plans. Beginning in the 1970s, however, the federal government has steadily decreased its share of the financial costs for many of these programs. In the late-1990s, in particular, the federal government drastically offloaded much of the costs to the provinces in an attempt to eliminate the federal deficit. This, in turn, placed massive financial pressures on the provinces, as they were faced with escalating overall costs for provincial social programs and dwindling federal transfers in support of these programs. During the late-1900s and early into the 21st century, provinces experienced rising annual deficits and ever ballooning debt loads. In recent years, the federal government has begun to increase its fiscal transfers to the provinces, particularly in the area of health care (although, the economic crisis beginning in late-2008, and the pressures it will place on federal finances, may reverse this trend). Nevertheless, federal support remains far short of its original commitments, and some provinces continue to struggle to pay for the ever-increasing costs of social services. This issue forms one component of a larger conflict over the general financial structure of the two levels of government, often referred to as the fiscal imbalance. This conflict centres on the allegation an imbalance exists between the financial capacities of the two levels of government and their spending responsibilities. More specifically, the argument suggests that the financial capacities of the provinces are too small relative to their spending responsibilities, while the financial capacities of the federal government are too great. The solution, it is argued, is to reframe the finances of the two levels of government, with the provinces receiving a larger portion of the national revenue pie. Consecutive federal governments have attempted to address provincial concerns, mainly by increasing federal transfers to the provinces. Liberal governments in the late-1990s and 2000s increased federal support for provincial health care programs. Moreover, in 2007, the Conservative federal government under Stephen Harper claimed it had eliminated the fiscal imbalance through changes to the federal Equalization Program. Nevertheless, it remains unclear whether these reforms will completely quell allegations of a systemic imbalance in federal-provincial finances. The federal spending power has been an important source of conflict between the federal government and the provinces. Some provinces have argued that federal spending power limits provincial power and represents federal encroachment on their exclusive jurisdiction; specifically, the provinces should be able to develop their own social policies and programs free from federal influence. As such, it has been argued that the federal government should provide financial support without placing restrictions on how the provinces may use that money. On the other side, the federal government’s position is that it’s entitled to place conditions on federal transfers, not only to ensure that federal monies are used in a manner that meet federal priorities, but also to promote a national system of social services that is uniform and fair across the country. The most publicized conflict in this context has been in the area of health care. As discussed above, the federal government contributes billions of dollars annually to provincial health care programs. Moreover, the federal government places certain conditions on how the provinces may use this money, which are outlined in the Canada Health Act. Under the Act, provincial health care systems must be public, comprehensive, universal, portable and accessible. The Act also prohibits the practices of extra-billing and user charges. If a province fails to meet one or more of these criteria, then the Act stipulates that the federal government may withhold portions of its transfers to that province. Since the Act was first passed in 1984, the federal government has applied the penalties in a somewhat limited fashion. In most cases, these penalties have been for extra-billing and have primarily been against the provinces of Ontario, Quebec, Alberta and British Columbia.